It’s a little bit ironic, but it turns out that the 9.4-ton Chinese space station crash may hit on April 1st – an unfortunate disaster for a day normally filled with levity and jokes. We promise it’s not a joke – the Chinese space station crash is headed towards Earth for a potential impact date of April 1. It turns out that this rapidly accelerating pile of metal wasn’t aware of the holiday, as a potential impact isn’t exactly a humorous occurrence. While we don’t yet know where exactly the Chinese space station crash will happen, we’re getting more and more sure of the date as the time goes on. While the Chinese space station crash is definitely concerning and an event that many agencies are keeping an eye on, there’s no need to cancel your Easter dinner and start hunkering down in a bunker. A recent analysis found that the odds of the Tiangong-1 Chinese space station crash hitting a person is “about 1 million times smaller than the odds of winning the Powerball jackpot.” When you combine those odds with the large swath of land where it could impact, it’s an astronomically small chance that anything will happen to you personally. Still, the potential Chinese space station crash is a subject of concern for both scientists and the general public alike, as no one really knows what the station was made out of or what we contained on it. China has been very reserved with the details they’re releasing about the Chinese space station crash – other than a warning that there could be toxic materials released in the impact. Whether that just means danger from rocket fuel or some other substance that could cause more damage remains to be seen, but it’s safe to stay you should steer far clear of the Chinese space station crash if it happens to hit close to you. Experts do warn of the highly toxic substance called hydrazine that could potentially survive re-entry – reinforcing the suggestion to avoid the Chinese space station crash at all costs. The Chinese Space Station crash was an inevitability after the Chinese space agency lost contact with their station back in 2016. It took two years for the station to start heading back towards an impact on Earth, but it’s coming and it’s coming fast. The damage from the Chinese space station crash will likely be minimal, but it’s the uncertainty regarding the crash that has many uneasy. Until we get extremely close to the crash we’re not going to have an idea of where the impact will happen, but it’s looking more and more likely that we’ll see it hit somewhere in North America. Also concerning is the potential for toxic chemicals to release, but considering that the majority of the craft should be burned up by the time it hits the ground, the impact from that – at least environmentally – should be minimal. In normal cases, space equipment is taken out of commission once it reaches a certain age. Like any sort of technology, as time goes on there are bound to be issues that come up. In addition to fixing issues, replacing space equipment allows us to upgrade our existing tech with new advancements that will help us better understand the galaxy around us. Many suspect that the Chinese space station outstayed its anticipated lifespan – and this failure to take the station down before the connection was lost is likely the main reason why we’re going to see a crash landing rather than a controlled re-entry. 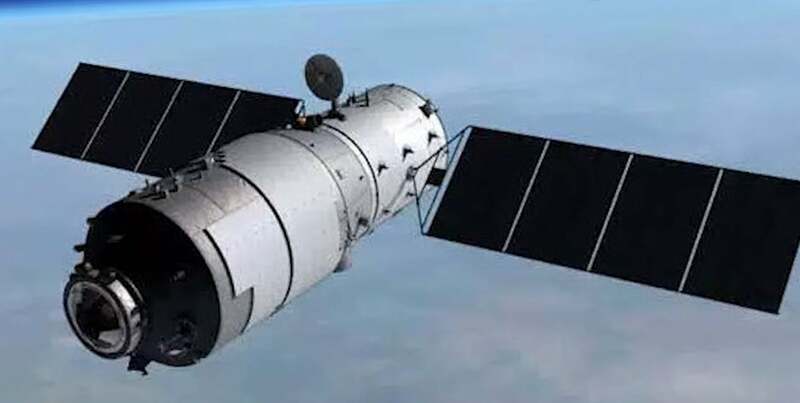 Fortunately, despite the fact that we’ll soon see a Chinese space station crash – perhaps even on April Fools’ – there are space agencies all around the world that are constantly monitoring the path of Tiangong-1. When we know exactly where the space station will hit, we will be well prepared – even if the chances of someone being hit are astronomically low. At the end of the day, the impact of the Chinese space station shouldn’t disturb your plans for Easter or the enjoyment of April Fools. It’s still an unfortunate event, but considering how many people are keeping an eye on it and the very low chances of anything actually coming from it, you should feel free to eat your ham and play a prank in peace.